The Build-A-Brand team believes in relentlessly pursuing multiple levels and methods of self-growth and positive work performance. We believe that determining your strengths and ways in which to improve them is how greatness begins. Continuous learning, as well as connecting with others who inspire you to be your better self, is how greatness progresses. We also recognize that the feeling of fellowship matters. Every person wants a healthy place where they can discover, share, participate, grow and ultimately, feel like they belong. This is why Build-A-Brand endlessly strives to connect with different online audiences, including yours. Not only does our team want to help you and your team succeed through sharing our branding apps and expertise but we also want to take part, learn, and absorb relevant information from others. We feel that the more knowledge we gain, the more useful information we can share. We want not only to enhance your experience with us but, the experience your consumers have with you as well. This is why we are extremely gracious and excited to connect with the AutoConverse community! 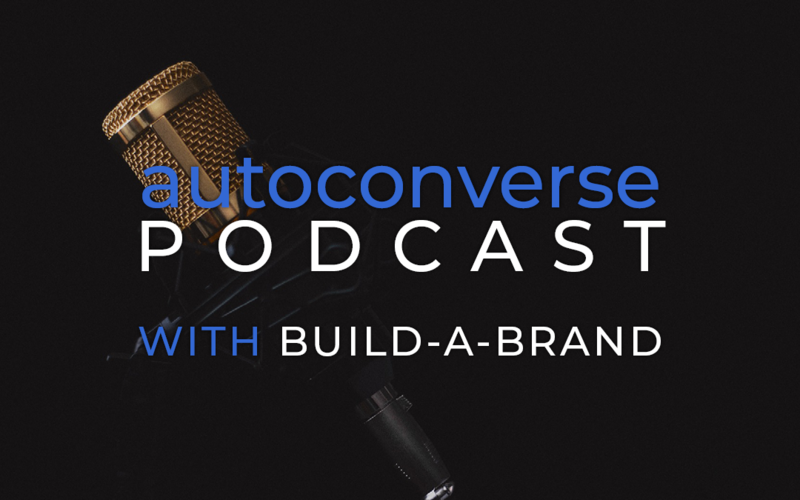 AutoConverse is an online destination, created by Ryan Gerardi, Chief Editor of AutoConverse.com and Founder & CEO of AutoConversion. Mr. Gerardi is a pioneer in developing and delivering content that assists small businesses, as well as individuals, in generating demand for their products and services. AutoConverse ON AIR, is a weekly webinar series that strongly focuses on “connecting with progressive minds that influence and contribute to how we get around and how we are connected”. The thought provoking webinar is one of many types of valuable content AutoConverse generates —informative blog posts and interesting pod-casts —but all are intended to provide people and businesses a place where they can share ideas, learn information, and discuss the “future of mobility and connectivity”. One of the most frequent topics visited on the AC ON AIR LIVE webinar, is that of branding, and as you know, we love branding! Build-A-Brand truly believes in the greatness that makes up the AutoConverse community and wants to connect with it. From this magnificent combination, our team members have taken Mr. Gerardi up on his invitation to be on his Wednesday, September 12th, 2018, AutoConverse ON AIR Webinar at 12pm CST. We will be going LIVE on the AutoConverse YouTube Channel! Guests, Amanda Ryan, Director of Social Branding at Build-A-Brand; Cameron Moore, Business Development & Training Director at Build-A-Brand; and Terry Lancaster, Social Sales Speaker & Build-A-Brand re-seller, join together with host, Ryan Gerardi, to discuss our favorite topic: you guessed it – Branding! Not only are we honored to be guests, but we are extremely grateful to be able to engage with the AutoConverse community. It is now our turn to pass along the invitation, to you! We invite you, your friends, employees, managers, and/or colleagues, to come watch, comment, and engage with us during the LIVE webinar! Mark your Calendars for Wednesday, September 12th, 2018 for 12pm -12:40pm CST! RSVP to AutoConverse Webinar on Facebook. Bookmark the AutoConverse YouTube Channel for easy access to watch this one and future webinars. Log in to leave comments and engage with us! We love hearing what you have to say! Sign up for backstage access to AutoConverse ON AIR LIVE Webinars.